A black thirteen-year-old, a white cop, an eyewitness account, a shattering fall. Do the facts matter when all will suffer? L to R: Tom O’Keefe and Migs Govea in DEAD DOG PARK at 59E59 Theaters. Photo by Ashley Garrett. Dead Dog Park directed by Eric Tucker, currently at 59E59 Theaters until March 6, begins and ends with a police officer standing on a table, looking out over the audience. He remains in this impressionistic tableau for a moment as if poised to receive a revelation. Then the action begins and we learn what Rob McDonald is doing and why he is compelled to look into himself for the truth of the events that occurred that fateful day in Dead Dog Park, NYC. From the outset, playwright Barry Malawer stirs us to question what might have occurred on the fourth floor of an abandoned building when Tyler Chapin (Jude Tibeau in a powerful, layered performance), the black 13-year-old who was running from officer Rob McDonald (Tom O’Keefe is on point throughout), fell out a window and shattered his body nearly losing his life. Did McDonald push Chapin out the window in a racially motivated act of excessive force trying to subdue him? Or was it, as McDonald testified again and again to his wife, his partner, his superiors, the press, and the jury, that he was attempting to save Chapin and while holding onto his belt, he lost his grip and Chapin plunged to the ground? The playwright uses these overriding questions to examine the incident from the perspectives of the black community, represented by the Sharonne Chapin and her black lawyer John Jones (Eboni Flowers and Ryan Quinn give strong portrayals), and Rob McDonald, his wife Angela McDonald and his partner Ricky Romero. Scenes shift between Rob and Ricky, Rob and Angela, and Jones and Chapin. 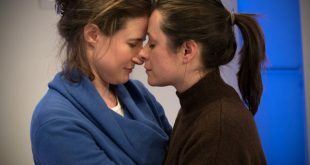 The playwright also includes scenes between Angela McDonald and Sharonne Chapin and a final explosive scene between Chapin and McDonald. What is made clear throughout is that where an officer is accused of brutalizing a black teen, given our social construct of law enforcement and economic classism, no one of the middle and lower classes wins. All suffer the indignities of the press, the media circus with its punishing, leering obtrusiveness, and the pain and torment of years lost, whether in recovering from physical injuries or in the emotional torture of a jail cell and shattered career. Eboni Flowers in DEAD DOG PARK at 59E59 Theaters. Photo by Ashley Garrett. Malawer tackles the social and economic fallout of residual racism, the unjust legal system, police brutality, and the travails of law enforcement by focusing on this incident and plunging it into uncertainty. Though the outcome is a win for Chapin and the black community because justice appears to be served, ultimately one may argue that the victory is a pyrrhic one. Each character is beleaguered by stress, oppressed by the convolutions of circumstance, emotionally tormented by the loss of a former life. Malawer suggests that such crisis situations occur because of the matrix of attitudes that create the fabric of the culture. Each individual involved must personally deal with the incident at Dead Dog Park; all are forced to confront an established social bulwark that protects monied elites. Meanwhile, their lives are decimated as they smash against that bulwark, bloodying themselves to achieve justice. So it goes for McDonald and his wife, and for Chapin and his mother, who represent different aspects of the class without wealth and power. Everyone else, especially the middle and lower classes, enters through the back door of institutions and specifically, as the play shows, of the legal system. Inside, the corridors are obstacled, and justice must be fought for with one’s entire strength and will. Regardless of whether one is on the “side” of law enforcement or from the community, the combat is ferocious and all embroiled in it are victimized by the circumstances. L to R: Tom O’Keefe and Jude Tibeau in DEAD DOG PARK at 59E59 Theaters. Photo by Ashley Garrett. The irony is that the “invisible hand” of the governing class has blinded “the opponents” to believe the community and civil servants are mortal enemies, when they are merely puppets fulfilling the roles of the social construct. With his equal treatment of all the characters, Malawer also makes this point: When economic and racial hardships foster communities where policing and security have an “us vs. them” ethos, the field is seeded with tragedy. The right climate and conditions will spawn misunderstandings and confrontations between law enforcement and those racial/ethnic communities they “police.” Ultimately, the harvest will be corruption, violence and death. Sadly, unless the structure changes, the same types of incidents will continue to occur. By revealing the perspectives of “all sides” Malawer has shown that the two “sides” make up one coin. The elites who control and use that coin to benefit themselves are inviolate, untouchable, invisible, and as such will never be assailed as long as the 99% remain divided. Director Eric Tucker’s choice of staging – all of the characters are present onstage with their backs to the audience or on the side most of the time as the play progresses, the courtroom scene especially – symbolizes that the guilt, oppressive circumstances, and media storm are everpresent in the minds of each of the characters as they are influenced and impacted by what they believe Rob McDonald’s actions were. They have all become interrelated through the incident at Dead Dog Park. Try as they might, they will never be able to extract themselves from the taint of what occurred nor forget the subsequent events, the trial and the aftermath. The ensemble of actors works well to reveal the measure of anxiety, pain and suffering that has etched itself into the characters’ lives and will never be erased. Though there are some minor slow spots in the dialogue between Angela and Rob, and in a few other scenes that are repetitive and seem without vitality of purpose, overall the production hit its mark. Dead Dog Park is an important play because of its powerful message and because of its undercurrents. This insightful production runs at 59E59 Theaters until March 6.